We have worked as glassmakers since 1989, moving to Project Workshops in 1994, and have devoted almost all of our time to re-creating Roman glass. In June 2001, we switched from making free-blown and mould-blown Roman glass to working full-time on mosaic glass for one year. In our capacity as glassblowers we have appeared on several British national television programmes devoted to archaeology. We have also supplied glass to several of Ridley Scott's films: 'Gladiator', 'Kingdom of Heaven', 'Robin Hood' and 'Exodus'. In 2005, with funding from English Heritage and other sponsors, we began our Roman Furnace Project. This Project was continued in 2006, and has inspired other wood-fired glassworking furnaces elsewhere in the world. 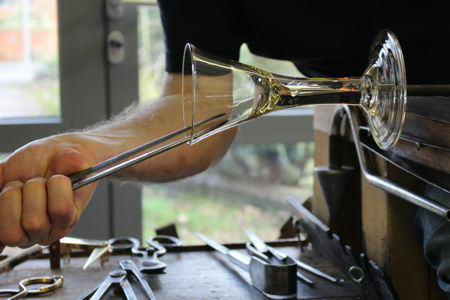 In 2007, we began to offer glassblowing demonstrations, adding to this in 2008 with glassblowing lessons. During the early part of 2010, we moved to our new, more spacious premises at Project Workshops. In 2011 we began to concentrate on 18th century English lead crystal glass - particularly baluster and twisted stem drinking glasses and goblets, as well as making the occasional contemporary piece. In 2008 we began making a week-long visit each year to Velzeke in Belgium to work at a wood-fired furnace. In 2014 we began similar visits to the Villa Borg in Germany - usually twice a year. 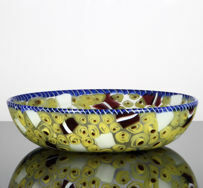 At both venues we have been able to carry out experimental work in ancient glassmaking techniques as well as working with other like-minded glassblowers. See our Events & Projects page. 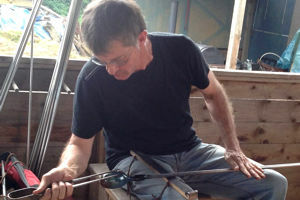 As well as undertaking private commissions (such as for the artist Grayson Perry) and making glass for films such as The Favourite and television programmes such as Outlander, we work on projects involving ancient and historical glassmaking and glassworking techniques, either at the request of others or as part of our own research. For example, we have reproduced the Amarna Fish for the BBC and have made glass for the King's Chocolate Kitchen at Hampton Court Palace. In 2016 we made a large quantity of sealed bottles for 'Montpelier', the home of James Madison, the fourth President of the United States, situated in Virginia, USA. We followed this in 2017 by making a large number of late 18th century bottles, sealed 'R. 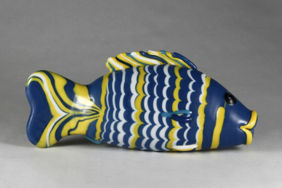 LENOX', for a commemorative edition of Madeira wine. In the pursuit of our work, we have attracted the interest and attention of many glass historians, and their help and support has been invaluable to us. 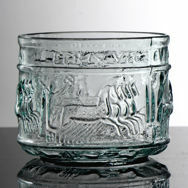 Our Roman Glassmakers and Georgian Glassmakers websites are archived on this page. Our glass has been used by several artists and engravers in their work. See this page for a selection of examples. This website is © Mark Taylor and David Hill 2015. It is written and maintained by Mark and David. Last updated 11th April 2019.